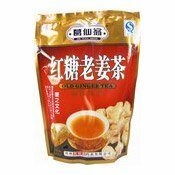 This product choose old ginger as raw material, refined after being distilled and concentrated with scientific method. It is convenient to drink and take. And it is also the preferred beverage of men and women, old and young staying at home or taking a trip in every season. Directions for Use: 3-4 times daily, 1-2 bags each time, take with boiled water. Storage method: Keep in seal up, cool and dry place. Simply enter your details below and we will send you an e-mail when “Old Ginger Tea (葛仙翁紅糖老薑茶)” is back in stock!